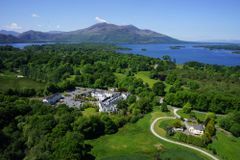 Located in the stunning Killarney National Park, the Muckross Park Hotel & Spa couldn’t be better situated for a golf break with the likes of the Killarney Golf & Fishing Club just around the corner. Also, awarded as The Best 5* Accommodation in Ireland as well as host to a 5* Spa, a stay here provides one of the most luxurious experiences in Ireland. Complimentary shuttle service into Killarney! Complimentary access to the vitality pool and thermal area! For a luxurious stay in Ireland, the Muckross Park Hotel & Spa has it all, with 70 luxurious bedrooms ranging from deluxe or superior bedrooms to suites featuring large bedrooms and living areas furnished with rich fabrics, flat screen TVs, bath and walk-in shower. All bedrooms also come with complimentary access to the 5* Spa Facilities, so be sure to make use of the Vitality Pool, Sauna, Steam Room, Tropical Rainshower and Hot Tub. All Treatments including facials, massages and exfoliation experiences, however, are paid for separately. For Dinner, guests can experience luxury fine dining at the award-winning Yew Tree Restaurant in the Victorian Lounge sampling the Wild Atlantic Way menu featuring prime Munster Beef and Atlantic Seafood. So regardless of how your round of golf went, you are sure to enjoy an incredible array of food after a day on the course. Or for a more relaxed evening, there is the award-winning Irish Pub, Jarvey’s Rest, which provides a traditional gastro-pub atmosphere and the ideal spot to enjoy the staple drink for anyone visiting Ireland, a smooth Guinness. Following dinner, a popular choice for guests is to head to Monk’s Lounge which has a warm atmosphere with an open fire to enjoy a few more drinks, but it is also a popular spot during the day for Afternoon Tea and Light Lunch with the Chef offering a wide variety of dishes to enjoy. Whilst in the Killarney National Park, guests cannot leave without exploring the local scenery and at the Muckross Park Hotel & Spa there is the opportunity to walk and cycle around the National Park seeing Torc Waterfall as well as go fishing in Lough Lerne. Muckross Park Hotel & Spa is the perfect destination for golfers seeking a luxury break to stay in an award-winning hotel, eat award-winning food as well as play the famous Killarney Golf and Fishing Club, which counts the likes of Sir Nick Faldo (1991 and 1992), Ross Fisher (2010) and Simon Dyson (2011) amongst its former champions as host of The Irish Open. Whilst Ireland has so many fantastic golf courses, the Muckross Park Hotel & Spa will provide the opportunity to combine amazing golf courses with stunning Irish scenery as well as 5* luxuries so it is the ideal hotel for a luxury golf break.